Daniel Levine’s revisionist take on The Strange Case of Dr. Jekyll and Mr. Hyde is an enthralling feat of storytelling, which not only does justice to the classic tale, but explodes it to reveal darker, deeper truths. We meet Hyde sitting in Jekyll’s laboratory, gazing at the envelope containing Jekyll’s account of the drug induced schism that doomed them both. Disgusted with Jekyll’s sanitized apology, Hyde pens his confession of what really happened. 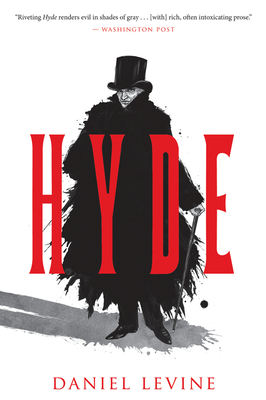 We peer as voyeurs through Hyde’s eyes as he is wrenched into the world, a frightened, half-formed, shadow of a shadow, more akin to Frankenstein’s monster than a sociopath, and watch him grow more savage, trapped in Jekyll’s hide, gnashing at man’s hypocrisy as a domestic animal. Like us, Hyde is desperate to know, “Why am I here?” Is he just a pawn in a deadly chess game Jekyll plays with himself? Levine’s London is a sordid, soot-stained beast, rendered with magnificent historical detail, a mirror labyrinth of mind as much as stone and brick. Hyde will make your heart pound like a cornered animal and haunt you long after the book-serum wears off. Summoned to life by strange potions, Hyde knows not when or how long he will have control of “the body.” When dormant, he watches Dr. Jekyll from a remove, conscious of this other, high-class life but without influence. As the experiment continues, their mutual existence is threatened, not only by the uncertainties of untested science, but also by a mysterious stalker. Hyde is being taunted—possibly framed. Girls have gone missing; someone has been killed. Who stands watching in the shadows? In the blur of this shared consciousness, can Hyde ever be confident these crimes were not committed by his hand?